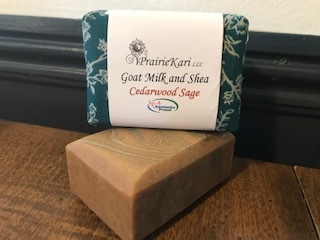 This soap has a warm, herbal/woodsy scent that appeals to the whole family. My granddaughters love to smell their hands after washing with this soap. Perfect for the shower or sink-side. Ingredients: Olive oil, local goat milk, shea butter, coconut oil, food grade lye, fragrance and cedarwood essential oil, French Green Clay and activated charcoal for color.